Do you want to get the most learning from the Senior Tech Club and Senior Tech Recipes? What is a Senior Tech Recipe? 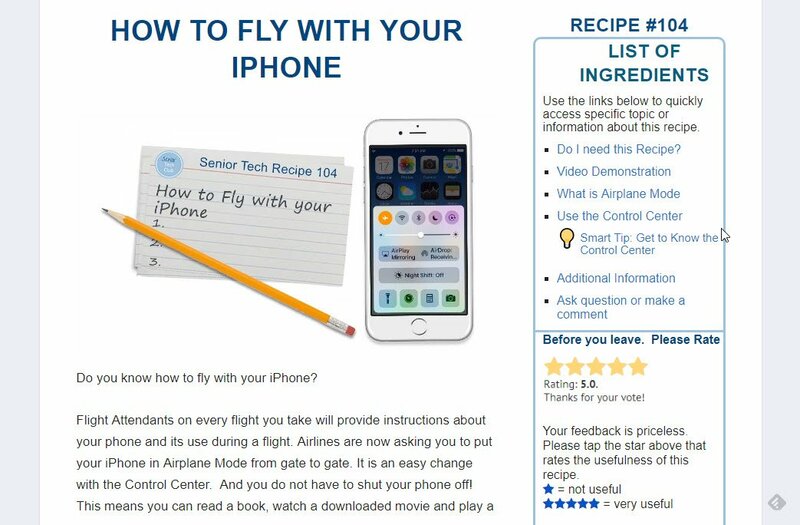 The Senior Tech Recipe is the bite-sized, brain-friendly lesson that provides the core learning of the Senior Tech Club. Recipes provide a quick way to teach and deliver lessons to Seniors with short and very specific bursts of useful topics. They are easy and quick to read and provide all of the essential information to learn a specific task. This recipe tells you how to learn from Senior Tech Recipes and get the most from your club membership. The idea for using recipes as a model actually came from Sharon, an early student who said, “What I need is a recipe to learn this.” Recipes break down specific topics with a set of instructions. Recipes are quick to study and easy to find with the search page. They do not require hours of reading or exploration to learn a topic. They will often include video demonstrations to get your started. 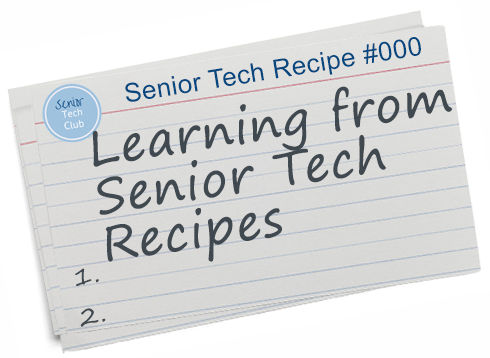 Every recipe at the Senior Tech Club provides a standard set of tools that you can use to get the most learning in the least amount of time. Each recipe has a List of Ingredients that lists the elements of the recipe. Each recipe offers a section for “Do I need this Recipe,” Smart Tips, Practice exercises and a place to ask questions. Many recipes include video demonstration. 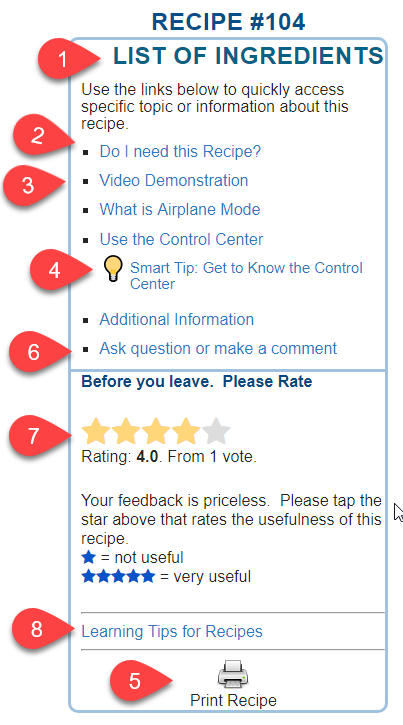 Finally, there is a place to ask questions or provide feedback and review feedback from fellow students. Here are eight tips to help you get the most from Senior Tech Club recipes and help you learn efficiently and quickly. It’s not a recipe without a list of ingredients! The numbers on the List of Ingredients linked to the numbered tips below. Just like the list of ingredients for a cooking recipe sets the theme and “do ability” of a cooking recipe, the List of Ingredients on the upper right of every Senior Tech Recipe provides an outline or an agenda that will guide your learning. Use the List of Ingredients to see the topics of the recipe. Quick Links – Every item in the list is a link to information included in the recipe. Tap or click a topic to take a shortcut to a specific section. If you just want to check our the Smart Tips in a recipe, just tap the link to immediately jump to that tip. Back to Top – As you use the links in the List of Ingredients to navigate a recipe, look for the up arrow on the right hand margin that will bring you back to the top of the recipe and the list of ingredients. 2 Do I need this recipe? A question that you should ask about any recipe is, “Do I need this recipe?” Tap or click the “Do I need this recipe” link to review a list of questions that will allow you to explore whether this recipe is right for you. We can easily agree that if you already know the answers to these questions, you should not spend time on this recipe. After reading and reviewing a recipe, you can use these same questions to check for your understanding of the topics of the recipe. Want a recommendation on where to start with any recipe? Video First – After you decide that a certain recipe is right for you, we recommend that you start with the video if the recipe contains one. It only takes 5 to 10 minutes and then you can use the printed material to review what you learned in the video and to get more detail about a recipe’s topic. The List of Ingredients will provide shortcuts links that you can use to access any Smart Tips found in the recipe. Smart Tips are simple, valuable tips and nuggets of information that will make you smarter and more effective with your device. Even if you decide that you already know the topics of a particular recipe, a quick review of the Smart TIps might still provide a valuable nugget or validate something that you already do. Unless you have lots of experience in working on a computer, we recommend that two screens or one screen and a printed copy are key ingredients to the successful learning from any recipe that requires methodical study. So if you have a computer or laptop or an iPhone and iPad, consider displaying this recipe on a second screen while using your device to explore and follow instructions. If you don’t have two screens, consider printing out the recipe. The List of Ingredients area provides a “Print Recipe icon that you can use to print the recipe. If you have comments or questions on the topic, the comments and question section provides a safe place to ask a question or share in other approaches that work for you. You can also respond to questions posed by other members. The Senior Tech club is all about Seniors helping Seniors. Before you leave, tap or mouse click on a star from 1 to 5 indicating how useful this recipe was to you. Not only will we used this feedback in future recipes but it is also your only indication that you have completed a recipe. We’ll be keeping track for you. Finally, every recipe has a link to return to this recipe. Return to these tips as often as you need. Every recipe at the Senior Tech Club is designed to enhance your learning. But we are always looking to improve our approach. If you have a question or comment about anything, don’t hesitate to submit your questions or comments below. We are always listening. Can you name 2 or 3 common elements that are found in every recipe? If you tap a link in the list of ingredients to jump to a topic, how can you quickly return to the top of the recipe?